At the end of a ramshackle jetty where the Ganges flows from India into the sea, a small family group pays homage to the holy waters. The chief celebrant, head swathed in a shawl, rings a bell and chants prayers as he floats an offering of flowers on to the muddy waves. A small girl hammers at a gong as an older man - unshaven with a white vest and loincloth - sounds a conch shell. Down the jetty someone hurls a deafening home-made firework to create a fountain of stinking mud. The waters bring life - but here in the Sundarbans, the world's largest mangrove forest, the waters are also taking life away. As sea level rises - partly as a response to climate change - two islands have vanished from the map. Professor Sugata Hazra, a stocky dynamo of a man, discovered their disappearance when he compared maps from the Raj with satellite images. He says 6,000 people have had to be relocated here because their land is underwater. People like Bashunto Janna. He is 81 now and says he has not got long to live. His family used to farm 85 acres on the vanished island of Lochachara. Now they have one acre in a village for displaced people on a nearby island, which itself is under threat from the waves. The Sundarbans straddle India and Bangladesh. Here on the Indian side, the Indian government is just about coping with the slowly unfolding crisis. Bashunto's adult children may hanker for life on the farm but at least they have homes and paid work. But Professor Hazra warns that the way the sea is rising, by the end of the century there will not be thousands on the move along this coastline - there will be millions. 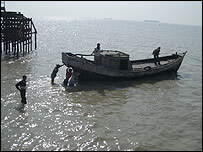 The problem is compounded by rapid population growth in the Sundarbans islands at the great delta in the Bay of Bengal. The islands are remote and hard to access - making family planning and education all the harder - while more and more families are flocking into the most vulnerable areas to make a living from the sea. As the waters rise it is expected that they will submerge the entire delta region, home to the legendary Bengal tiger. And scientists on the Intergovernmental Panel on Climate Change (IPCC) are forecasting that problems here will be made much worse by more severe storm surges, droughts and floods. 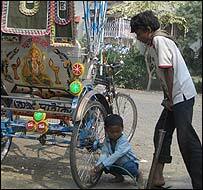 From Calcutta you can follow the Ganges upstream to witness climate change from the other end. I climbed 18 months ago to the glacier that feeds the Ganges - Gau Mukh, or cow's mouth. A great rotting meringue shot through with grimy Himalayan dust. It is an extraordinary journey - especially on a festival when pilgrim swamis are smearing themselves with ash before dousing in the icy melt waters of the holy river. The more extraordinary when you see how much that glacier has receded recently. Glaciologists in Delhi think it will not last the century. The people living in the upper reaches of the river will be worst affected by this change. People like 60-year-old Sangita who lives only a few metres from the fast-flowing shallow river in a village just where it hits the plains. Her fellow villagers are sucking the ground dry with the tube wells they use to irrigate their crops. Many take water direct from the river to supplement the wells but if the glacier dries up, so will the summer flow of the river. That will leave millions of people short of water for part of the year - at a crucial time when crops are thirsty as well as people. Sangita and her family have not heard of climate change - they are focused on trying to make their lives a little more comfortable. When I visited her the temperature was in the 40s. I tried to engage her in a fantasy speculation on what she would buy if she had as much money as people in the West. But she could not think further than a fan to cool her down a little... oh, and maybe a fridge. Sangita earns little - and pollutes little. The average Indian produces around a 10th of the greenhouse gases of the average European - a 20th of the average American. That helps to explain the attitude of India's political leaders to the recent request from the US and Europe that India should join talks on restricting emissions. One of the reasons given by President Bush for America's rejection of the Kyoto Protocol was the absence of emissions targets for the Asian giants. India's politicians observe the Texan lifestyle, compare it with Sangita's lifestyle and consider the president's demand morally outrageous. Some Indian politicians think climate change is an excuse by the West to suppress the economic boom that is intoxicating this great nation. So while the Chinese government willingly joins preliminary talks on a future global climate agreement, India either attends as a silent observer or does not attend at all. India's political leaders may be interested in gaining cheap finance for clean technologies through the world trading system in carbon emissions - but they are not interested in even thinking about limiting emissions from their coal-fired power stations while so many millions scrabble in poverty. They want to see the rich nations keep promises they made under the UN Framework Convention on Climate Change in 1992 that they would make the first move in cutting emissions. And so far there is little sign of that. Scientists are warning us that if we fail to cut emissions, the future will be hard for people like the families of Sangita and Bashunto who live on the margins. They did not cause the climate problem - but they are likely to suffer most from it.